In order to reduce the occurrence of thermal stresses in steel during welding work, the material can be preheated. After welding – or another treatment – the material can be annealed for stress relieving, so that the durability of the product is improved even more. 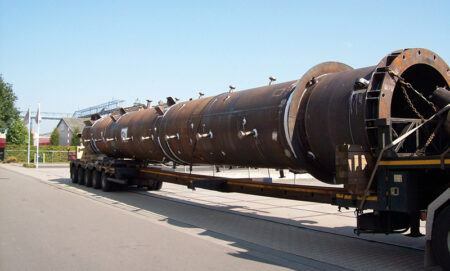 Preheating is used to bring the steel to be welded – with a thickness of more than 10 millimetres – to a base temperature of between 100 and 200 degrees Celsius. This reduces internal stresses and prevents undesired hardening when the material cools down. This prevents cracking. An additional second heat treatment after welding can be applied on top of the preheating process: stress relieving annealing of the material. This treatment is also useful after deformation, bending, setting, or casting steel. Stress relieving annealing removes internal stresses from the steel at a temperature of between 580 and 620 degrees Celsius. For smaller products, Smit Industrial Heat Treatment offers so-called combined annealing: several products from various clients are placed in one oven for stress relieving annealing. This process means that heat treatment can take place at a very competitive rate. If you would also like to improve the quality and durability of your products, then please feel free to contact the specialists at Smit Industrial Heat Treatment without obligation.